The Saval Reflex is an automatic fire detection and extinguishing system that can be easily installed in closed rooms up to 24m³. The Reflex is not only insensitive to faults due to its unique design, it also provides fire safety at a very attractive price. Within minutes the system can be installed, after which the unique detection element monitors your valuables 24 hours a day. 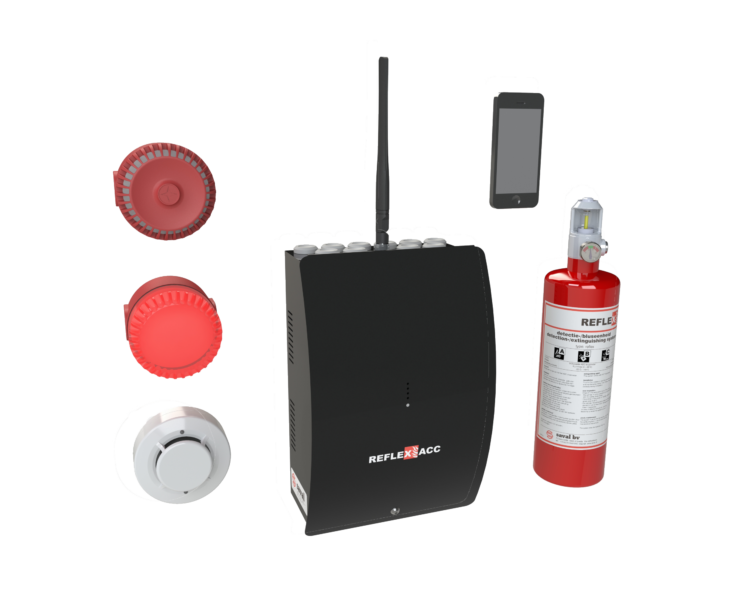 When you choose ABC extinguishing powder in this automatic fire detection and extinguishing system you are assured of excellent extinguishing power combined with an attractive price. Since the large collateral damage that can be caused by extinguishing powder on electrical equipment in particular, we advise you to include this liability in your decision. Choosing the right Saval Reflex for your application is not difficult. If you know the fire risk (solids = A, liquids = B, gases = C) and the net contents of the compartment, you already know enough. This automatic extinguishing system is available in versions from 1 to 12 kilograms. Fast detection through a unique parabolic Reflex detection head.Pressure indicators fitted to check the operating pressure of the system.Activation by the heat of the flames, so unwanted extinguishing is virtually impossible.Simple and fast installation by means of a bracket with safety strap.PED and RCD approved (CE mark).This automatic fire extinguisher is also available with a manual control button and / or alarm transfer (see options).